I love breakfast food! It's so homey, and comforting, and full of carbs! Seriously, I could eat pancakes and waffles covered in fake syrup everyday. But then I'd have to buy a new wardrobe. I didn't really give traditional pancakes much thought until recently. They are delicious. End of story. But then our quadruplets showed up, and Sean and I decided to lose some weight and somehow, refined sugar and the pointless calories in bleached white flour started to bother me. I decided I wanted to make those calories count nutritionally. Obviously, something had to be done about the pancakes as giving them up was not an option. 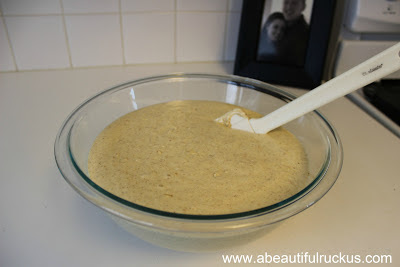 So I did some googling, pinning, and facebooking, and eventually snagged a protein pancake recipe from a friend. I did tweak it slightly, but it is a total winner! And since we eat breakfast for dinner regularly, I don't have a problem serving these. Okay, yes...these do have cottage cheese in them. But, before you go running off, hear me out. I was concerned about eating a big slab of baked cottage cheese myself, so I totally understand the warning bells going off in your head. The ingredients are pureed together so well, that unless you tell someone that these have cottage cheese in them, they won't even know it's there. Seriously, even die-hard cottage cheese haters won't guess what's in these. I promise. And it's an easy recipe, so just give it a try before deciding you won't like it. 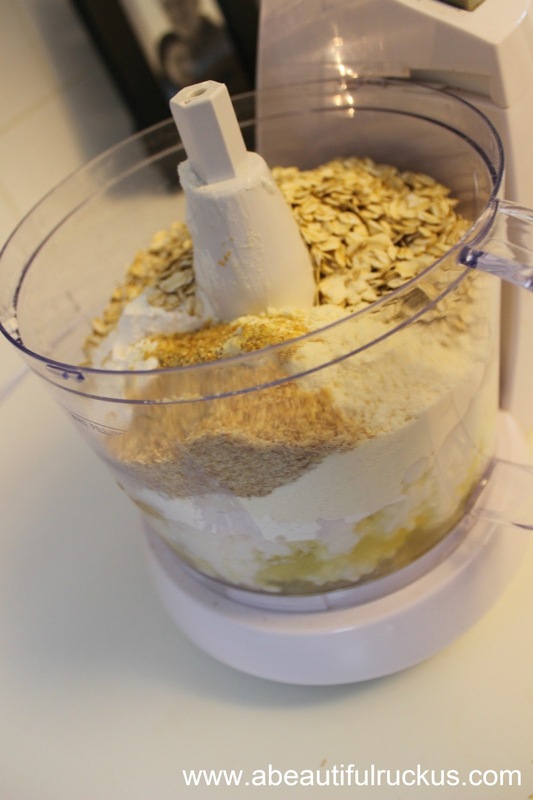 Dump all of your ingredients into a food processor. 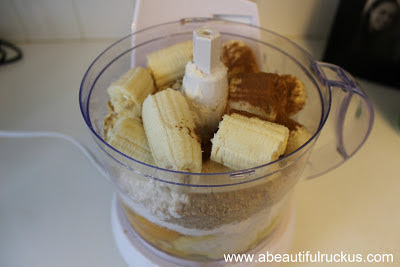 Add your bananas and cinnamon on top. Puree until smooth, dump in a bowl for easy scooping, and you are ready to go! Cook these like any normal pancake. See? I told you this was super easy! Get yourself some fresh fruit for the top of these. My go-to are strawberries. They are an absolute perfect combination with the bananas in the batter! Yes, it costs a little more, but buy the real maple syrup for this dish. You can use way less (just a drizzle!) 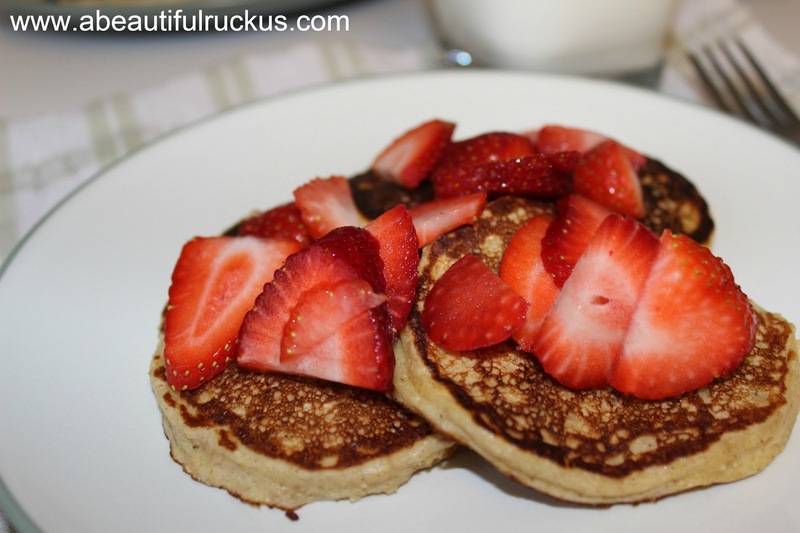 by topping the pancakes with fresh fruit since the fruit is already sweet. Also, it tastes better. And it's better for you. The recipe goes easily from pancake griddle to waffle iron. I do it both ways depending upon my mood. These pancakes turn out slightly denser and more chewy than regular pancakes. If you are expecting super fluffy pancakes, you might be disappointed. But these are insanely filling and worth the slightly flatter eating experience. 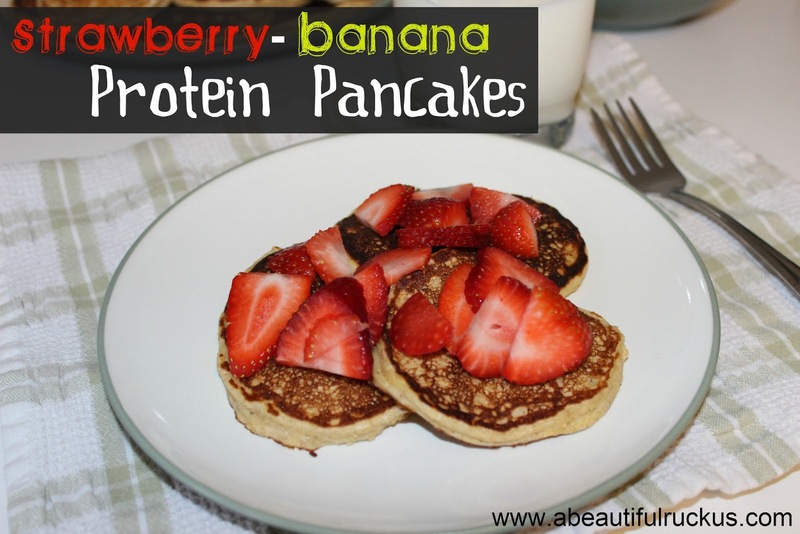 Each pancake has 48 calories and 4 grams of protein. 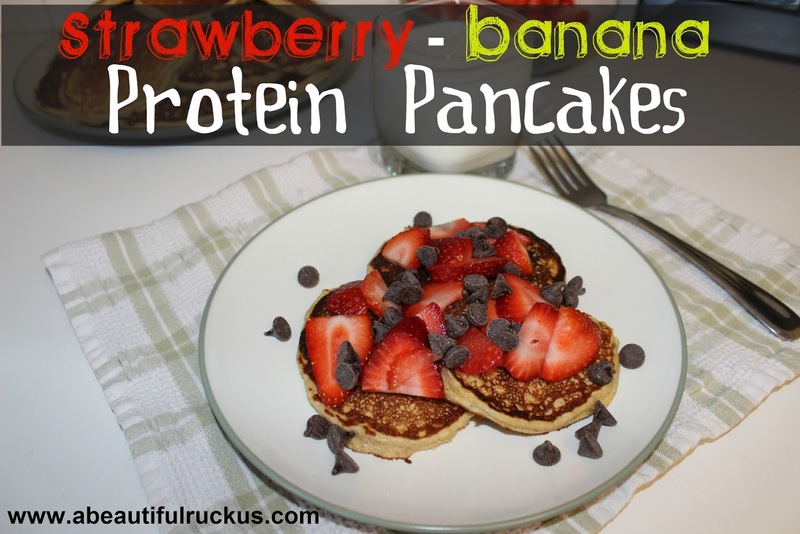 Plus, there are only 6 carbs and 1 gram of sugar per pancake. Beat that! Throw everything in a food processor or blender, and blend until smooth. 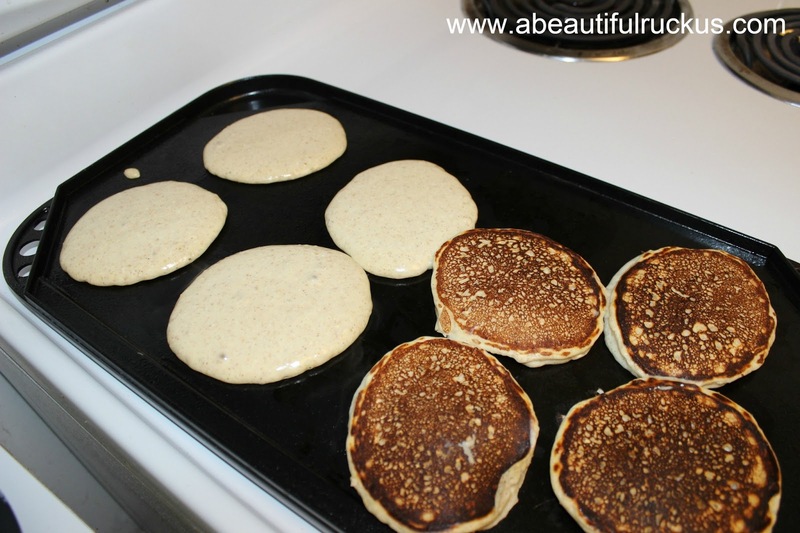 Cook on a pancake griddle or in a waffle iron. Make sure to use non-stick spray between every batch as there is no oil in these pancakes. Top with slices of real fruit (strawberries and blueberries are awesome!) and real maple syrup! It's hard to beat 48 calories! Mmm...thanks for the tips on sweetening it up a bit. I might try that next time! These look absolutely delicious! :) Thanks for sharing! I want to try this recipe out soon. I'll just tweak it a little to make it gluten free. Yum!